DYNAMIX VC- MP/SP - is a Long Reach Ethernet VDSL Extender with one Ethernet port (RJ-45 connector) and one VDSL port (RJ-11 connector). It is a bridge mode modem, well adopted VDSL (Very-high-data-rate Digital Subscribe Loop) technology to extend Ethernet service over single existing or new copper UTP (Cat 5 or greater) wire. 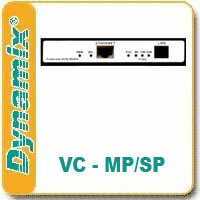 DYNAMIX VC-MP (master) delivers power and IP connectivity for DYNAMIX VC-SP (slave). DYNAMIX VC-SP delivers power and IP connectivity for PoE devices. For users will now be able to deploy PoE devices in any service location. You can install wireless access point, RFID scanners, IP cameras or access control systems in any place where you have basic wire connectivity. Automatic fault protection and power monitoring ensures reliable delivery of essential power and data to/from remote locations. DYNAMIX VC-MP/SP supports 5M/ 15M/ 25Mbps symmetrical bandwidth over single phone wiring with long driver capable of a maximum 1000m (3280 feet). Therefore, DYNAMIX VC- MP/SP supports auto-speed / fix speed, plug & play operations on the subscriber-site, and power protections as: OVP (over voltage protection), OCP (over current protection), robust short-circuit protection and surge protection. DYNAMIX VC- MP/SP is an ideal solution for delivering cost-effective and high-performance broadband services for point to point application. DYNAMIX VC-SP (slave) delivers power and IP connectivity for PoE devices (for example: Wireless Access Point or IP Camera).